TOKYO, Nov, 20 2018 - (JCN Newswire) - MHI Engine System Philippines, Inc. (MHIES-P), a company operated in the Philippines by Mitsubishi Heavy Industries Engine & Turbocharger, Ltd. (MHIET), a Group member of Mitsubishi Heavy Industries, Ltd. (MHI), has delivered two MGS (Mitsubishi Generator Series) diesel generator sets to SM Center Ormoc, a commercial facility newly opened in the city of Ormoc on the west coast of the Philippines' Leyte Island. 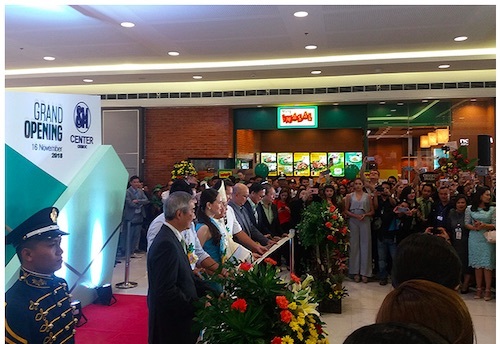 SM Center Ormoc is a project of SM Prime Holdings, Inc., one of the largest developers and operators of retail shopping centers in the Philippines. A ceremony, attended by representatives from MHIES-P and other parties concerned, was held at the site on November 16 to mark the occasion. MHIES-P was established in April 2007, with its headquarters located in Muntinlupa, a city within Metro Manila. MHIES-P serves mainly as a sales and after-sale servicing base for the MGS within the Philippines. The newly delivered units have generating capacities of 1,700 and 1,400 kilowatts (kW), respectively. MGS feature diesel engines manufactured by MHIET in Sagamihara, Japan, and are integrated with generators and auxiliary equipment purchased at Mitsubishi Heavy Industries Engine System Asia Pte. Ltd. (MHIES-A) in Singapore and MHI Engine System Vietnam Co., Ltd. (MHIES-V) in Vietnam. They are widely adopted as stand-alone generators on islands and at other locations where construction of large-scale power plants is difficult, and also for emergency use in buildings. The MGS have outstanding competitive strength against corresponding American and European models in the Southeast Asian market, owing to their superlative quality, reliability and product appeal. 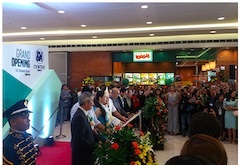 The Philippines, fueled by rapid economic development, today is the scene of a sustained rush to construction large-scale facilities, particularly in Metro Manila: commercial complexes to meet growth in consumer spending, office buildings to accommodate rising BPO (business process outsourcing) demand, etc. Along with this trend, demand for emergency-use diesel generator sets is surging. Going forward, such developments are projected to expand beyond Metro Manila to the country's outlying urban areas such as Ormoc, where the two MGS were delivered, driving further demand for MGS installations. 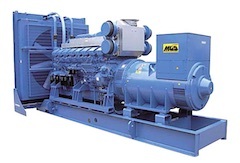 In the coming years, MHIET, together with its parent company Mitsubishi Heavy Industries Forklift, Engine & Turbocharger Holdings, Ltd. (M-FET), will look to the Philippines as an important market for MGS. In addition to pursuing expanded new orders on the strength of the gensets' robust track record, efforts will also focus on improving servicing operations for previously delivered units, as a way of achieving further sales expansion in the future.